Thanks, Steve and Alain, to both of you for that careful work. Very helpful. There are some more recent books on Greek divination, and also its survivals via Roman Empire to medieval Western Europe; I read them once but would have to go to the library to be sure I knew what I was talking about. Meanwhile, I have been working on Ch. 5 of Moakley. THERE ARE two characters in the triumphal procession who are rather hard to account for. They are the lowest of the trumps and the wild card known as the Fool. The Fool has no place in the procession, either with the four ordinary suits or among the trumps. Carnival, like a noble wedding or a solemn entry, was one of the favorite occasions for triumphal processions. In particular, there would be a procession to greet King Carnival before the beginning of Lent. This took place just after Christmas, when he would be the highest and most victorious of the triumphs. At the close of the pre-Lenten season his position would be reversed, for he then had only one day to live. 1. For the identification of Il Bagatino and II Matto as Carnival King and Lent see the notes for those two cards. 2. For the Carnival triumphs see Burckhardt (Civilization) Pt V ch 8: "The Festivals." The Saturnalia was a winter festival commemorating the golden age of Saturn, the age when the fruits of the earth were bountiful and men were at peace. There was no money in that time, and therefore no greed for gold. No man was a slave, and all property was held in common. Good King Saturn died, and the golden age was dead except when brought to life again for a few days each year during the festival. For that short time slaves and masters were equal. Slaves were permitted to speak as boldly as they wished, to get drunk, issue orders to their masters, and in general be excused for behavior which would have been fatal at any other time. Psychologically speaking, it was an excellent safety valve. But it had its dark side. In the earliest times the man elected to play the part of King Saturn during the festival had to die at its close. When the actual death was prohibited in later days, no doubt there was an execution in effigy, as in the medieval Carnival. We have a glimpse of the Carnival in its heyday from the program of a Carnival at Rome in 1891, which was celebrated in the medieval manner. (5) The Carnival season began on January seventeenth, and from that date it was lawful to wear any costume and to cover the face with a mask. The formal celebrations began two weeks later, and lasted for ten days, from February first to the tenth. The official Carnival was inaugurated by the grand Senatorial Procession, with participants wearing costumes of the fourteenth century. This procession started at two o'clock in the, afternoon at the Piazza del Popolo and moved by way, of the Corso and the Via Nazionale to the Costanzi Theater. It was a procession of men-at-arms, cavalcades, heralds, and trumpeters, preceding the Senator of Rome and his suite. 3. For Saturnalia and Carnival see the abridged edition of The Golden Bough, by Sir James George Frazer (New York, Macmillan 3.440) 383-587 and 301-307. 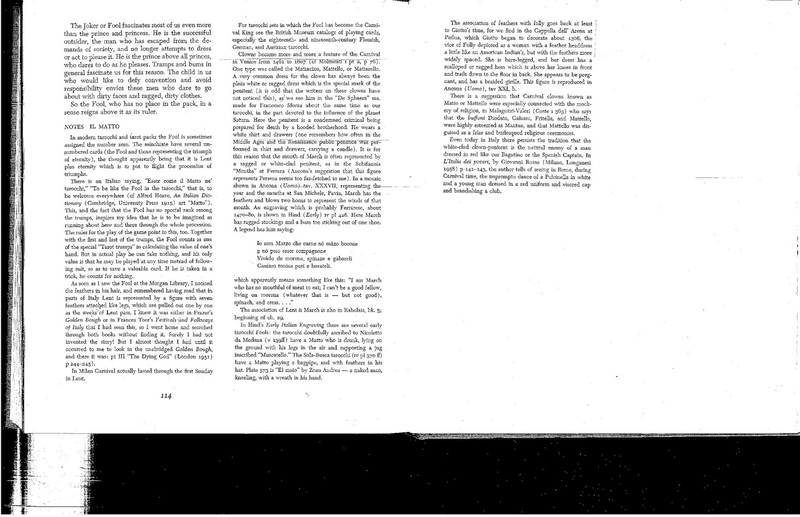 Our bibliography lists T. H. Caster's revised abridgment, The New Golden Bough, which seems not to object to these passages, and Professor Homer W. Smith, in his Man and his Gods (New York, Grosset 1952) 138-139, says practically the same thing as Frazer about the Saturnalia. See also Bernheimer (Wild) p 53ff — who is, however, to inclined toward the idea of a secret society being involved, I think. 4. The resentment of the laity against the clergy during our period appears in the tarocchi themselves, which make the Pope and Popess captives of Cupid, and again and again in the secular literature of the time. See Huizinga (Waning) p 178f and Burckhardt (Civilization) pt VI eh 2: "Religion in Daily Life." 5. The description of the Carnival of 1891 is from Carnival at Rome. When it arrived at the theater, the first grand veglione (masked ball) of the Carnival began. This was a children's party, with prizes for the best costumes. In the evening there were two more veglioni in other theaters. The next day, Monday, featured a band contest and a fete at the Wine Show. Here too, prizes were awarded for the best costumes. On Tuesday there was a parade of the Senatorial Cortege, the race in which the rioni (the various quarters of the city) competed, and a horse race. There was throwing of red chalk in the Corso, and in the evening a veglione with prizes. On Wednesday the horse races continued, and there was a grand artistic fancy dress ball in the evening, with prizes again for the best costumes. An added attraction was a great chess board in one of the theaters, on which the pieces were living people. This chess game was played by two members chosen from the Roman chess society. On Thursday, February fifth, a traditional triumphal procession was held, with decorated vans, masqueraders on horseback and on foot, all competing for prizes. A battle of flowers took place from two o'clock until dusk. In the evening there was a grand illumination of the Piazza del Popolo by Messrs Fantappié and Sons from Florence. In it were twenty colossal transparent Chinese fans lighted with various colors: and twenty streams of light from the top of the obelisk. Two separate veglioni were held, each with prizes. The next evening there was a "white" veglione at the Costanzi Theater, to which only masqueraders in white were admitted. The program for Saturday the seventh included another battle of flowers, more racing, and the usual veglione. On Sunday there was a parade of two-horse carriages and a veglione. Monday, the last day but one of the Carnival, was marked by the award of prizes for the most elegantly decorated balconies along the Corso, the route by which the Senatorial Cortege proceeded to the racing in the Piazzo del Popolo. In addition, there was a wine fair, and of course, a veglione in the evening. People were advised that the best time to see this veglione was from midnight until two. the moccoletti, with a procession of bengal lights and illuminated vehicles. The evening concluded with the cremation of King Carnival, fireworks, and a balloon ascent. From the historical evidence we have gathered, we may quite logically deduce that the commedia dell'arte was an outgrowth of the fifteenth-century Carnival. This type of farcical comedy improvised by skilled actors on the basis of a written plot could easily have developed from the sort of procession which appears in the Visconti-Sforza tarocchi. (6) If we imagine the Fool, the representative of Lent, running alongside the procession and calling his warnings to the riders in the cars, we can assume that they talked back to him. Happy bits of repartee would please the crowds and encourage the actors to do even better. Finally the representative of Lent might invite King Carnival to leave the safety of his car and fight like a man. (7) Then we would have a scene such as Breughel shows us in his painting "The Battle between Carnival and Lent," where jolly fat Carnival sits on a wine barrel. With a spitted goose for his weapon, he fights the representative of Lent, in this case an old woman like the Popess of the tarocchi, who had to take the place of the Fool when the latter eventually assumed the guise of Carnival King. In Breughel's painting we see in one corner a comedy troupe engaged in playing "The Dirty Bride", and observe that they look very much like characters who were originally part of our triumphal procession. So even in the tarocchi we have the old story of the sacred king, who has a merry reign for a short time and then is put to death by his successor, The Carnival King is the first of the trumps, and his successor, King Lent, is just outside the door, waiting to dethrone him and take over his staff of office. The King is dead! Long live the King! 6. The best books I have found on the commedia dell'arte are Smith (Commedia) and Lea (Italian), which is much more detailed than Smith. Enci spett has good articles on "Carnevale" and "Commedia dell'arte." 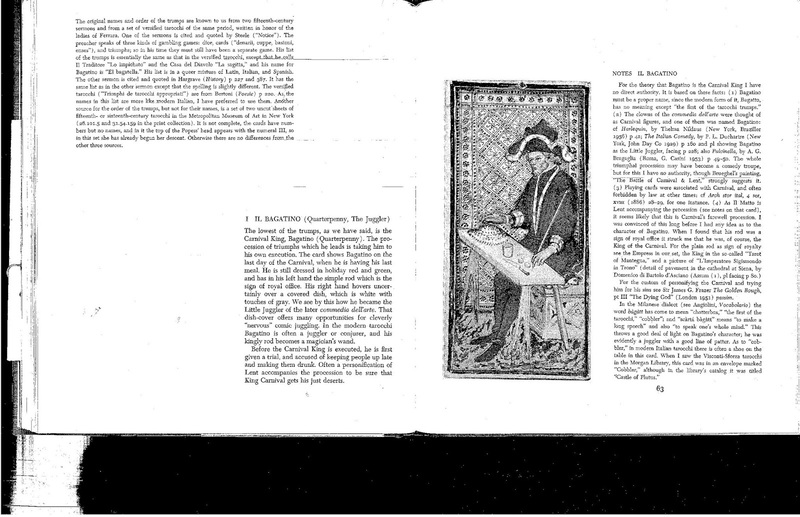 I suspect a connection between the tarocchi characters and those of the commedia because they are so similar; Smith (p 59, note) gives as the list of essential characters in the commedia two lovers, three women, one Scaramouche who plays the part of the braggart Captain, Pantalone, the Doctor of Law, Mezzetin, and Harlequin. The boastful Captain says that he once took prisoner Love, Death, and the Devil, and went to Hell to steal Proserpina. The Moon forgot Endymion for him, and he conquered Cupid in battle. (Smith 93-95). See also the first paragraph of the Notes for Il Bagatino, the first of the trumps, who was a character of the commedia. Pictures of the Carnival characters and the commedia characters can hardly be distinguished, and there is the same slapstick in both. 7. See the reconstruction in my "Undocumented Prologue," above. 8. For the metamorphosis of the Fool see the notes for that card. One problem with these description of Carnival is that it seems to be based on celebrations and characters from at least a century after the PMB. What can she tell us about Carnival in Northern Italy before 1450? If we imagine the Fool, the representative of Lent, running alongside the procession and calling his warnings to the riders in the cars, we can assume that they talked back to him. Happy bits of repartee would please the crowds and encourage the actors to do even better. Finally the representative of Lent might invite King Carnival to leave the safety of his car and fight like a man. 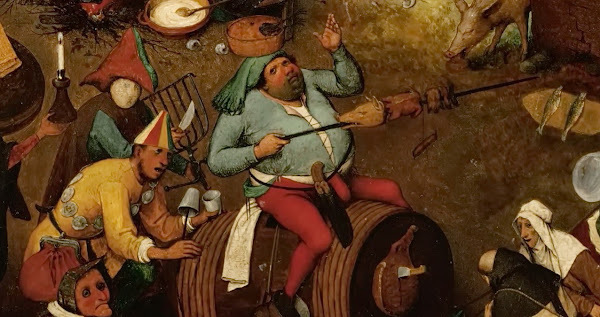 (7) Then we would have a scene such as Breughel shows us in his painting "The Battle between Carnival and Lent," where jolly fat Carnival sits on a wine barrel. With a spitted goose for his weapon, he fights the representative of Lent, in this case an old woman like the Popess of the tarocchi, who had to take the place of the Fool when the latter eventually assumed the guise of Carnival King. In Breughel's painting we see in one corner a comedy troupe engaged in playing "The Dirty Bride", and observe that they look very much like characters who were originally part of our triumphal procession. He is wearing a huge meat pie as a head-dress; he is wielding a long spit, complete with a pig's head, as a weapon for the fight. The pouch of knives at his belt indicates that he is a butcher - the guild of butchers traditionally provided the meat for the carnival feast so his place at the procession's heart is apt. The man behind the barrel is dressed in yellow, which is connected with deceit, and he is followed by a female figure who is carrying on her head a table with bread and waffles on it. They don't say what waffles indicate. The image of deceit more fits other images of that time and place, notably the Bosch workshop's "Conjurer", a painting filled not just with illusion but deceit (the pickpockets, at least) (https://en.wikipedia.org/wiki/The_Conjurer_(painting)). The PMB figure, however, is not yellow but red. Nor does the personification of Lent look much like the PMB Matto, although I do admit a likeness to the Popess. She (or is it a he with stubble on his face?) looks to me like a parody of the religious fanatic. Neither has any parodies of kingly attributes. Wikipedia calls them Carnival and Lady Lent. The latter's hat, as well as her dress, is somewhat reminiscent of the PMB Popess's tiara. She is not much like Bosch's equivalent of the PMB Matto, namely, his two "Wayfarer" figures, with their sticks very similar to the PMB's (https://en.wikipedia.org/wiki/The_Wayfarer, https://en.wikipedia.org/wiki/The_Haywain_Triptych (scroll down to "shutters"). If there is any relationship to the tarot, the suggestion would be that of the "Fool's Journey", toward an uncertain future. 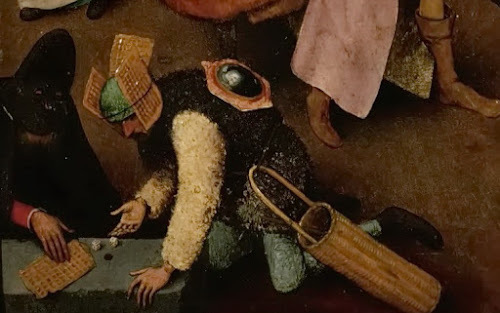 More like Bosch's wayfarers--and some tarot Fools, too, in the 16th century (Cary Sheet as a proto-Tarot de Marseille, Rosenwald Fool/Bagat) is the Fool who gingerly leads an "Everyman" couple through life. Wikipedia is rather disparaging about the couple, saying that the bulge on the man's back represents egotism and the woman's unlit lantern represents lack of reason, and the fool's lit torch represents dispute and destruction. It seems to me more positive than that, a symbol of light in the darkness. That he is leading them through the middle of the scene (next to the well that both sides share) indicates the avoidance of the two extremes. I was intrigued by the two people in the left bottom corner. Is the one whose face is hidden (probably for good reason) a fortune-teller consulting his lot-book? Right above these two is the performance of "The Dirty Bride". The onlookers do not look like tarot figures to me. There is one procession in the painting, religious people all dressed alike invading Carnival (click on the image at https://en.wikipedia.org/wiki/The_Fight ... l_and_Lent). That kind of procession is believable. I am not done with Carnival and Lent. Moakley has some other things to say, more relevant to the PMB, in her sections devoted to the two figures ("Bagatino" and Matto) in the two sections she refers to in her notes. I will do them next. Kind of Lotoquine boards or lot book sheets ? It's not such a bad ordering and makes some sense finally, no? The fourth being used like some kind of games boards, moving along the square holes (12x7 grid) according to the amount thrown? "The fourth being used like some kind of games boards, moving along the square holes according to the amount thrown?" "By the 16th century, paintings by Joachim de Beuckelaer, Pieter Aertsen and Pieter Bruegel clearly depict the modern waffle form. Bruegel's work, in particular, not only shows waffles being cooked, but fine detail of individual waffles. In those instances, the waffle pattern can be counted as a large 12x7 grid, with cleanly squared sides, suggesting the use of a fairly thin batter, akin to our contemporary Brussels waffles (Brusselse wafels)"
Yes, good about the waffle. I hadn't made the connection, which is obvious. Here is what else Moakley says about "Bagatino" and the Matto. It's in Part II of the book, where she discusses the individual cards and the suits in more detail. "Bagatino" is the first one and Matto the last. Although using the Bertoni order of trumps for everything else, she seems to be going to the "Steele Sermon" for the Matto, which has it last. It probably has to do with her interpretation of it. The lowest of the trumps, as we have said, is the Carnival King, Bagatino (Quarterpenny). The procession of triumphs which he leads is taking him to his own execution. The card shows Bagatino on the last day of the Carnival, when he is having his last meal. He is still dressed in holiday red and green, and has in his left hand the simple rod which is the sign of royal office. His right hand hovers uncertainly over a covered dish, which is white with touches of gray. We see by this how he became the Little Juggler of the later commedia dell'arte. That dish-cover offers many opportunities for cleverly "nervous" comic juggling. In the modern tarocchi Bagatino is often a juggler or conjurer, and his kingly rod becomes a magician's wand. Before the Carnival King is executed, he is first given a trial, and accused of keeping people up late and making them drunk. Often a personification of Lent accompanies the procession to be sure that King Carnival gets his just deserts. For the custom of personifying the Carnival and trying him for his sins see Sir James G. Frazer The Golden Bough, pt III "The Dying God" (London 1951) passim. In the Milanese dialect (see Angiolini, Vocabolario) the word bagatt has come to mean "chatterbox," "the first of the tarocchi," "cobbler"; and "scarta bagatt" means "to make a long speech" and also "to speak one's whole mind." This throws a good deal of light on Bagatino's character; he was evidently a juggler with a good line of patter. As to "cobbler," in modern Italian tarocchi there is often a shoe on the table in this card. 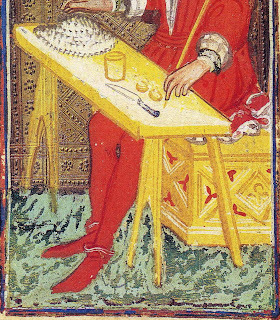 When I saw the Visconti-Sforza tarocchi in the Morgan Library, this card was in an envelope marked "Cobbler," although in the library's catalog it was titled "Castle of Plutus." IL MATTO (The Fool) The Fool is never numbered. He is not one of the trumps but rather, their worst enemy. During the entire time the procession has been moving he has been threatening it with the club he carries. In fact, one can see him running alongside the great cars and brandishing his club at the gayest of the riders The seven feathers in his hair, and the ragged penitential garments which he wears, show that he is the personification of Lent, which puts an end to the Carnival season. According to custom, one of his feathers will be pulled out at the end of each week in Lent. The figure of Lent himself will be destroyed in effigy on Holy Saturday when the fast ends. But now he is on the point of claiming his seven-week kingship. "Just wait until tomorrow!" he has been saying to the gay knights and ladies of the tarocchi. Into the fire with all of you cards then!" And so it would be. A good Ash Wednesday sermon would send people enthusiastically home to bring out cards, gaming boards, and false hair to be burned in the "bonfire of the vanities." It only added to the fun and fascination of Carnival to have Lent threatening it, and people enjoyed the antics of the Fool so much that in time they forgot he was the spirit of Lent. Then the Popess became Lady Lent, as we see in Breughel's famous painting, "The Battle Between Carnival and Lent," and the Fool was looked upon as the Carnival King himself. In later versions of the tarocchi we can see how he became now the double of the oId Carnival King, and then his supplanter. In some packs the first of the trumps and the Fool are both shown as Harlequins. In others the second of the trumps, instead of representing the Popess, shows the Spanish Captain Fracasse. The Captain is dressed rather like the old King, our Bagatino, and he is the special enemy of the first trump, though people have long since forgotten the reason. It is still a Carnival tradition that the Carnival King who wears the white clothes typical of the clown, is the special enemy of some character dressed in red such as the Spanish Captain or Bagatino. This happens too in the commedia dell’arte which, we believe, grew out of the Carnival buffooneries. The Fool also is the forerunner of the Joker in today's bridge cards. The Joker or Fool fascinates most of us even more than the prince and princess. He is the successful outsider, the man who has escaped from the demands of society, and no longer attempts to dress or act to please it. He is the prince above all princes, who dares to do as he pleases. Tramps and bums in general fascinate us for this reason. The child in us who would like to defy convention and avoid responsibility envies these men who dare to go about with dirty faces and ragged, dirty clothes. So the Fool, who has no place in the pack, in a sense reigns above it as its ruler. In modern tarocchi and tarot packs the Fool is sometimes assigned the number zero. The minchiate have several unnumbered cards (the Fool and those representing the triumph of eternity), the thought apparently being that it is Lent plus eternity which is to put to flight the procession of triumphs. In Milan Carnival actually lasted through the first Sunday in Lent. For tarocchi sets in which the Fool has become the Carnival King see the British Museum catalogs of playing cards, especially the eighteenth- and nineteenth-century Flemish, German, and Austrian tarocchi. Cauiaro tonina port e burateli. which apparently means something like this; "I am March who has no mouthful of meat to eat; I can't be a good fellow, living on morona (whatever that is — but not good), spinach, and cress. . . ."
The association of Lent & March is also in Rabelais, bk. 5; beginning of ch. 29. In Hind's Early Italian Engraving there are several early tarocchi Fools: the tarocchi doubtfully ascribed to Nicoletto da Modena (v 139ff) have a Matto who is drunk, lying on the ground with his legs in the air and supporting a jug inscribed "Muscatello." 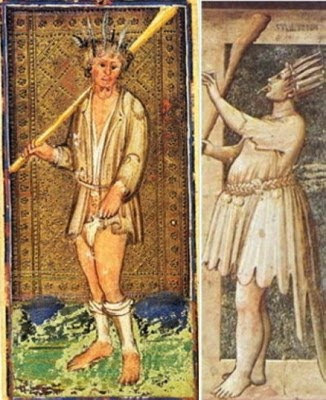 The Sola-Busca tarocchi (iv pl 370 ff) have a Matto playing a bagpipe, and with feathers in his hat. Plate 573 is "El mato" by Zoan Andrea — a naked man, kneeling, with a wreath in his hand. The association of feathers with folly goes back at least to Giotto's time, for we find in the Cappella dell'Arena at Padua, which Giotto began to decorate about 1306, the vice of Folly depicted as a woman with a feather headdress a little like an American Indian's, but with the feathers more widely spaced. She is bare-legged, and her dress has a scalloped or ragged hem which is above her knees in front and trails down to the floor in back. She appears to be pregnant, and has a braided girdle. This figure is reproduced in Ancona (Uomo), tav XXI, b. There is a suggestion that Carnival clowns known as Matto or Mattello were especially connected with the mockery of religion, in Malaguzzi-Valeri (Corte 563) who says that the buffoni Diodato, Galasso, Fritella, and Mattello, were highly esteemed at Mantua, and that Mattello was disguised as a friar and burlesqued religious ceremonies. Even today in Italy there persists the tradition that the white-clad clown-penitent is the natural enemy of a man dressed in red like our Bagatino or the Spanish Captain. In L'Italia dei poveri, by Giovanni Russo (Milano, Longanesi 1958) p. 141-143, the author tells of seeing in Rome, during Carnival time, the impromptu dance of a Pulcinella in white and a young man dressed in a red uniform and visored cap and brandishing a club. ... :-) ... in Cologne they burn the "Nubbel" = "somebody" tonight, earlier it was named the "Zacheias", in Jülich they burn the "Lazarus", in Düsseldorf the "Hoppeditz". Nobody of these is the Prinz Karneval. One reason that the "spoof" explanation must be questioned is that the triumphal processions were more than a gay festival, they were part of the psychological preparation for the Lenten season. The spirit was gay and almost anything was permitted, but the themes were sacred and regarded as such by the people. One can spoof a patriotic parade, but the spoof better not include dragging the flag in the mud. Some foolishness was expected, but the deeper value of the allegory could not really be spoofed, short of sacrilege. We can see O'Neill's point simply by looking at the "Battle of Carnival and Lent" painting. Both sides are spoofed, yet there is a deeper meaning: the sensual man of Carnival is attachment to ephemeral things, which for salvation in eternity must give way to the spiritual man. At the same time the senses themselves can be utilized for this transition, of which the painting itself is an example. The divine first appears in sensual form. So likewise the procession at Epiphany of the Three Kings delights the senses while preparing us for death. In Moakley's account of the feathers on the PMB Fool, she cites the chapter on "The Dying God" in The Golden Bough. This applies to the Carnival King (or Prince) as well as the King (or Lady) of Lent. Christianity recast the mythology of the Saturnalia in its own image. It did not abolish "the dying god" but made him its central figure, the crucified Christ. God appears on earth in sensual form to give his message and then points the way forward by dying to that life, both in life and in death. So the Carnival King's death has a double message: death to the sensual man, but thereby preparing for spiritual rebirth. It spoofs the sensual man, but within that context the spiritual message is untouched, for it is not the senses themselves that are spoofed, but merely the use of them as an end in themselves. Can we say the same about the "Bagatino". 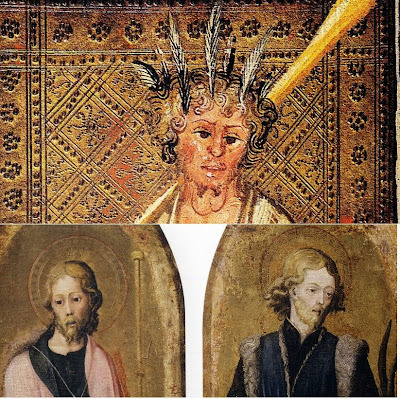 The image on the right is from a Bembo painting of Christ's ascension, which I reproduce from the 2013 Brera catalog on the Bembo and the tarocchi. Red, green, and white are the colors of the Magi (as well as Faith, Hope, and Charity). That red is predominant suggests to me the blood of Christ. 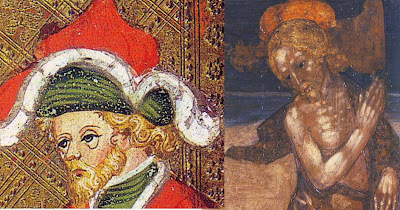 It is true that the Bembo painted a lot of male faces in a similar fashion: a St. Mark in the Cavalcabò Chapel of St. Agostino, Cremona ( Tanzi, Archigoticissimo Bembo, 2011, p. 70), also the second king in an Adoration, and a couple of King Davids in an illuminated manuscripts (all in Bandera and Tanzi 2013). But there is a relationship to Christ for these people, too. Moakley calls the figure "Bagatino", asserting that the word has no meaning other than the card. Actually, it was the word for a coin of very small denomination in Bologna, according to the etymological dictionary. The heading of the section called "Bagatino" even gives a correct translation: quarter-penny, the smallest denomination of English money. It goes with his monicker "le petit", the little one. It fits the Carnival King, in the eyes of the Church, but also Jesus, God in the humble form of an itinerant beggar. But in fact the earliest name on record for the card is in the "Steele Sermon": El Bagatella. Moakley says that this is a mixture of Spanish and Italian. Actually, I think "El" is an old Italian form of the definite article, too. It indicates that the card is not "La Bagatella", meaning "trifle", but rather the illusionist called with the same word, the "chatterbox" whose patter distracted from his hands. Ross found the word quoted by Muratori from a 13th century poem (translation by Marco Ponzi). Quanto più si mostra bella, /Come anguilla squizza via. Gli posa appresso il Bagatello, percioche si come coloro, che con prestezza di mano giacando, una cosa per un' altro parer ci fanno, il che oltre alla maraviglia porge vana dilettatione, non essendo il suo fine altro che inganno cosi il Mondo allettando altrui sotto imagine di bello, et dilettevole promettendo contentezza, al fine da guai, et in guisa di prestigiatore non havendo in se cosa premanente ne durabile, con finta apparenza di bene, conduce a miserabil fine. (He placed the Bagat [in Italian, Bagattello] next to him [meaning the Fool], because,like those that play with swift hands, making one thing look like another one, causing wonder and a vain amusement, since his only goal is deception, in the same way, the world attracts the others [literally, attracting others] with images of beauty and delight, promising happiness at the end of trouble, as a juggler it contains [literally, "in the manner of a slight of hand artist, having"] nothing either permanent nor durable, and [he?] leads to a miserable end, under the false appearance of good. Well, yes, but so is the world itself, from which the road to the divine begins. Plato's Republic (of which Filippo's secretary had in 1440 completed a new, readable translation) compared the world of the senses to shadows cast on a cave wall from unseen puppets and an unseen fire. (To the followers of Augustine, buried at Pavia, Plato was the pagan whom Augustine had put in service to Christianity.) It is that world into which God descended to become Jesus, and which crucified him. His wand does resemble a scepter (as well as other things, such as an innkeeper's nib pen), suggesting a king. Well, Jesus was considered King of Kings (or "prince of princes", in Moakley's phrase). There is also the term "Juggler", which she also uses and takes as someone who keeps plates and cutlery in the air as an exercise in skill and humor. Actually, that is a modern sense of the term, unrecorded before the 19th century, according to the Oxford English Dictionary, 1997 Additions. The first date they find for its use is 1807. On the other hand, different meanings attach to the word in the years in question, more appropriate to an entertainer (sense 1, obsolete), trickster (sense 2, used mainly up to the 17th century), and conjurer (same). It is an incorrect translation in relation to the English language currently. It is a good translation only in obsolete senses of the word. A better translation would be "street magician", for that is where he was found, in the piazzas. Mainly he was on a raised platform, or bench, attracting crowds for the selling of patent medicines, looked down upon by the medical establishment. He might also be doing the "shell game", luring in those who think their eyes are faster than his hands, who find that they have lost their money by the end. He is not one of the trumps but rather, their worst enemy. During the entire time the procession has been moving he has been threatening it with the club he carries. Together with the first and last of the trumps, the Fool counts as one of the special "Tarot trumps" in calculating the value of one's hand. But in actual play he can take nothing, and his only value is that he may be played at any time instead of following suit, so as to save a valuable card. This sounds like a very cooperative relationship with the other trumps. It is rather like Jesus's self-sacrifice in a state of powerlessness for the sake of humanity. At the end of the hand, both he and the Bagatella are valuable point-getters, however. The analogy might be to their worth if "played right" after the end of life (comparable to the hand). The seven feathers in his hair, and the ragged penitential garments which he wears, show that he is the personification of Lent, which puts an end to the Carnival season. According to custom, one of his feathers will be pulled out at the end of each week in Lent. The figure of Lent himself will be destroyed in effigy on Holy Saturday when the fast ends. The association of feathers with folly goes back at least to Giotto's time, for we find in the Cappella dell'Arena at Padua, which Giotto began to decorate about 1306, the vice of Folly depicted as a woman with a feather headdress a little like an American Indian's, but with the feathers more widely spaced. She is bare-legged, and her dress has a scalloped or ragged hem which is above her knees in front and trails down to the floor in back. She appears to be pregnant, and has a braided girdle. Perhaps Giotto, too, had Lent in mind. The posture seems to imitate, foolishly or mockingly, that of a pope blessing the faithful, in this case the crowd at the end of the parade. There is also the play on "fool" in I Corinthians, with the fool in the eyes of the world, the fool for God, who is no fool but the most prudent of all, because he sees life as a whole, including after death. It is the "Holy Fool" again. In that case, the pregnancy is symbolic of rebirth. Here, being neither oneself nor someone else, one is supremely united to the completely unknown by an inactivity of all knowledge, and knows beyond the mind by knowing nothing. Of course it is the hallmark of the fool to "know nothing". And Saturn, besides being an evil planet, was also associated with wisdom and the Golden Age. Again the spoof has an ironic twist. So I think Moakley's thesis can be saved. Before and behind the spoof we see in the cards is the Christian message, which is never negated, merely stated in a witty way that, besides being just what it appears, also suggests the opposite of what appears. It is the same as in the "Mass of Fools" and the "Mass of the Gamblers" (see Andrea Vitali at http://www.associazioneletarot.it/page.aspx?id=435), which spoofs that which the rest of the year the participants (minor clerics) take very seriously. However these two figures cannot be taken in isolation from the rest of the triumphs, maybe even from the rest of the 78 cards. So we must soldier on.